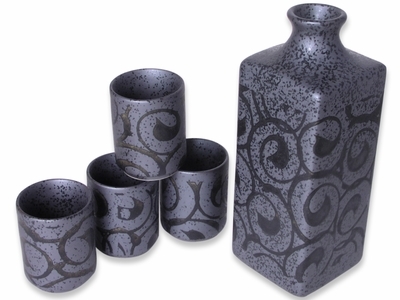 This Ceramic Sake Set encourages guests to linger over the rice wine for even longer. The two-toned rectangular jug and four sake cups are crafted from earthy ceramic, but have all the qualities of a high-end piece of Asian tableware. The exterior is glazed in two tones of black. The Karakusa design is done in a matted, deep charcoal, while the base of the ceramic sake set is lighter, softer tone and is speckled. To the eye, this Ceramic Sake Set is a single smooth surface, but to the touch the two tones of black feel distinct. The same is true on the white version of this set. While many classical Japanese sake sets are designed to hold either warm or cold sake, this set is made for both. That gives you twice the opportunities to use it in your home or restaurant. The rectangular shape of the jug, a representation of the Japanese kimono, is a contrast to the circular cups, a shape that symbolizes intuition. One traditional aspect of this Black Ceramic Sake Set is the Karakusa design gracing the exterior of the jug and sake cups. The spiraling pattern is steeped in the history of Japanese ceramicware and art. With kara meaning "China" and kusa translating to "plant" the design is found on porcelain, ceramic, and other pottery dating from ancient times in Japan. In this contemporary take on Karakusa, the traditional and modern-day collide.